Gray is beautiful. I wish mine would go gray--it just keeps getting a darker mousey brown. 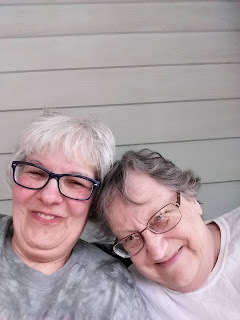 My sister is 11 years older than me and hers is not going gray either, it just keeps getting darker and darker. Our hair used to be naturally blonde! Now it's the darkest it's ever been. I love my gray, and you and Jacky are adorable.